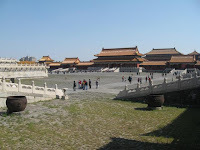 It happens that it was Sunday when I went to the Forbidden city. There were tens of thousands of tourists. The city is pretty big, with few large squares, a big garden, and plenty of ancient buildings, that looked to me almost the same (well, I mean the same style, some are bigger, same are smaller). 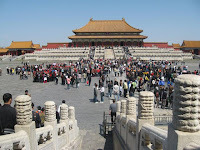 There are many gates, and also many buildings full of history of emperors and concubines. 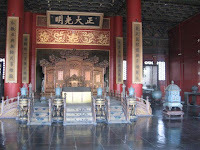 In most of the buildings there were exposed different objects from different times. I went and visited also a clock exhibition. 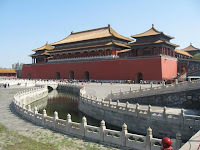 Overall, I wasn't too excited about this place; it was way too much history to understand (2 dynasties of Emperors (24), Ming and Qing. On the other hand, this place is unique. It took me few good hours to see most of the places.